In our final blog for the 2016 Animal Tracker, we try to make sense of the results by exploring awareness, support, and cognitive dissonance. I’ve been involved in animal advocacy for over 20 years – more than half of my life. Like most activists, I’ve come to understand that animal liberation is a long-term struggle. And long-term struggles require a long-term perspective of how things change. That’s why Faunalytics created the Animal Tracker, now in its ninth year. This post finalizes our coverage of the 2016 Animal Tracker results. The first blog covered the overall results and methods. Our second post focused on knowledge and the third examined the importance of protecting animals. The fourth blog looked at rates of agreement with various animal statements and the fifth post covered perceptions of the movement’s impact and support for advocates’ goals. Of course, animal protection is a diverse cause area. People are much more familiar with companion animal welfare than wild animal suffering, for instance. 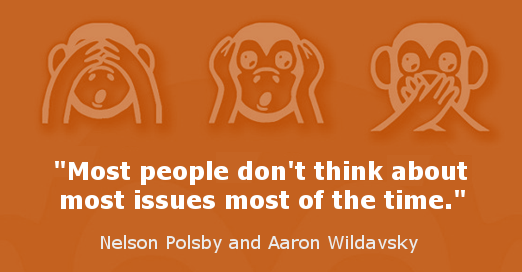 But we can say with confidence that most people don’t think about most animal issues most of the time. That lack of consideration and urgency for animal protection is one of the most important hurdles faced by animal advocates. With that important caveat in mind, following are some observations from the 2016 Animal Tracker, which included five questions. For each question we have four data points from 2008, 2010, 2013, and 2016 to help us understand trends. However, most differences over time are modest and within the margin of error. Below we focus on the larger demographic and longitudinal differences and their implications. Lastly, see the final sections below for access to the full results, the dataset, and our newly updated graphing tool! Underscoring the illusion of public opinion, Animal Tracker results show that most adults in the U.S. know little about animal issues. In fact, most people say they are “not very” or “not at all” knowledgeable about all types of animals except companions. Moreover, self-reported knowledge is at or near an all-time low for most of the animals covered in the survey. Animal protection remains a topic about which most people have relatively little knowledge. Most U.S. adults are either too busy working multiple low-paying jobs or wasting hours keeping up with the Kardashians to think about animals. If they have time to think about causes at all, then they probably gravitate to one of the higher visibility issues. Despite the enormity of its ethical implications, animal liberation lags behind other movements. Our movement lacks the institutional influence of climate change advocates, the social momentum of LGBTQ rights advocates, and the political power of gun rights advocates. So it’s no wonder that people have generally low knowledge of animal issues. That said, some demographic groups stand out as having slightly more self-reported knowledge. Specifically, women, people who live with companion animals, and those with more formal education are more knowledgeable of animal issues. When it comes to race, there is some indication the Black people report being less knowledgeable about animals, while Latino/Hispanic respondents are slightly more knowledgeable. When looking at trends, one factor to consider is that the baseline year of the Animal Tracker was 2008. This was a voting year in the U.S. in which animal issues received unusually high visibility thanks mostly to state ballot initiatives. If true, this could explain the decline in self-reported knowledge since 2008. It also suggests that our more organized and coordinated efforts can move the needle and increase knowledge of animal issues. Even if that increase is only temporary, it might be taken as an encouraging sign for animal advocates. Despite decreasing knowledge about animal issues, however, belief in the importance of animal protection actually appears to be increasing over time, albeit modestly. Knowledge of animal issues may not be necessary for people to support protecting animals, at least rhetorically. But it’s probably important for people to think more deeply about animal suffering if we are to turn that rhetorical support into widespread behavior change. This disconnect between attitudes and behavior is evident throughout the Animal Tracker results. Knowing that difference is essential to understanding the broader human-animal dynamic. To put it simply, people hold simultaneous but opposing beliefs when it comes to animals. For instance, most people say they oppose all animal suffering while continuing to believe it’s okay to consume meat, test on animals, wear fur, hunt wildlife, etc. It’s what psychologists call “cognitive dissonance.” Just as a fundamentalist Christian will favor creationism over evolution, and vote accordingly, other people believe that their personal behavior does not cause animal suffering – despite evidence to the contrary. Unfortunately, what often happens when people are made aware of their own conflicting attitudes and behavior is that they adapt their attitudes to fit their behavior. And they process new information through a lens that reinforces existing beliefs. More than half (55%) of U.S. adults say protecting animals is important to them when voting for a political candidate, but in reality animals are not a major political issue. Nearly three-fourths (73%) say protecting animals is important to them when buying meat, eggs, and dairy products, but most do not even buy “higher welfare” products. More than half (52%) agree that people have an obligation to avoid harming all animals, but most of them participate in some form of animal abuse. Four in five (81%) U.S. adults support the goal to minimize and eventually eliminate all forms of animal cruelty and suffering, but they are not considering wild animals. Half (50%) of U.S. adults agree that farm animals deserve the same consideration as pets and other animals, but very few people eat their companion animals. Animal advocates should take heed. It’s not enough to speak the truth and then expect people to internalize it and change their behavior. Persuasion is a more nuanced process that requires a deep understanding of one’s target audience, a message that resonates rather than conflicts with existing beliefs, and an ongoing “discussion” with people instead of just a one-time message. Making progress for animals will require connecting with people on a deeper level than simply providing more evidence of animal suffering. Dr. Melanie Joy developed the concept of “carnism,” which is predicated in part on the belief that eating meat is “natural, normal, and necessary.” Unfortunately (and inaccurately), the perception that some types of animal use are “necessary” is a common one. It applies not just to animals used for food, but also animals used in experiments, animals in zoos and aquariums, and certain types of human behavior like hunting and fishing. Nearly two-thirds of U.S. adults agree that “using animals for food is necessary for human survival” (after removing those who say “do not know” or “no opinion”). That’s a discouraging number, but the trend is encouraging: the agreement rate has declined consistently, from 70% in 2008 to 64% in 2016. More than a third of U.S. adults now disagree that eating meat is necessary. If the trend continues, carnism itself may start to fragment. The Animal Tracker also explores the perceived “necessity” of animal testing for medical advancement. Interestingly, the agreement rate was unchanged from 2008 to 2013, with a slight majority of 55% agreeing that animal research is necessary. In 2016 this figure dropped below a majority, to 47%. Our findings are consistent with a large drop in the perceived moral acceptability of animal testing from 2001 to 2015, conducted by Gallup. Why are we changing our beliefs about the necessity of using animals? We need more data and can only offer speculation, but I think it may be due largely to technology. I think most people already know, on some level, that animal farming and animal testing are morally questionable. But technology – through plant-based meat and animal testing alternatives – is helping show people that using animals isn’t so necessary after all. The Animal Tracker examines a range of different demographic groups that allows animal advocates to identify its supporters and detractors, overall and for each issue area. The biggest demographic determinant of someone’s support for animals and animal protection is gender. Put simply, women are far more pro-animal than men. Women are more likely to believe that protecting animals is important. This was true for every type of animal covered in the survey. Women are more likely to agree that animals are capable of thought and emotion, that farm animals deserve consideration, and that people have an obligation to avoid harming animals. They’re less likely to think that it’s necessary for humans to eat, dissect, or experiment on animals. I take this as an encouraging sign. Despite Hillary Clinton losing the 2016 election, women are increasingly taking on positions of power in local and national governments and in corporations. While the progress is slow, I think this will have a long-term and positive effect on policies toward animals. Another group that is consistently supportive of animals and animal protection is people who currently live with one or more companion animals. It raises the question of whether encouraging non-traditional companion animals (e.g., farmed animals) might expand our sphere of compassion. The differences between the two groups are modest, however, underscoring that our love for companion animals doesn’t always extend to other types of animals. When it comes to ethnicity, there is no clear and consistent distinction. Black and Latino/Hispanic respondents are more likely to support the goals of the animal protection movement than are White respondents. Black and Latino people are also less likely to agree with the “necessity” of both testing on animals and eating animals. However, Black people are less likely to think animals are capable of thought and emotion and are less inclined to protect endangered species. People with more formal education are generally less supportive of some animal protection measures. For instance, they are more likely to think that animal research, dissection, and wearing fur are acceptable. But those with less formal education (which correlates with age and ethnicity) are less likely to agree that animals are capable of thinking and feeling emotions and less likely to support protecting endangered species. Lastly, those in the Southern and especially the Midwestern United States are usually less supportive of animal protection than those living in the Northeast or West. The regional differences are surprisingly modest, however, and centered around animals used for food given the focus on farming in the Midwest. We provide all Animal Tracker data publicly. Depending on your interests and goals, you can get the summary data, download the complete dataset, or explore the data with our graphing tool. To see our analysis of the 2016 Animal Tracker results, please visit the set of blogs mentioned in the intro above. To see the previous analyses of past years of the Animal Tracker, please visit our independent studies page. Crosstab Data: This Google spreadsheet provides the topline Animal Tracker results for all years (see separate tabs), including the detailed results for different demographic groups. Results are weighted. Full Dataset: Our full Animal Tracker dataset is available in R and SPSS formats, providing respondent data at the individual level for analysis purposes. Access the full data on our datasets page. Graphing Tool: Our Animal Tracker graphing tool lets you visualize all years of the Animal Tracker data to explore differences by group and over time. The tool was generously developed by Animal Visuals. The Animal Tracker is the only longitudinal opinion survey dedicated to animal issues. It is also a collaborative study. Faunalytics manages the project, but we rely on donations from individuals and funding from sponsors to continue the study. Sponsors get early access to detailed survey results and the exclusive option to add their own question(s). Year ten of the Animal Tracker will be fielded in the first quarter of 2017 and will cover topics including trends in animal-related behavior, belief in the importance of humane education, and support or opposition to different advocacy tactics. Faunalytics will be accepting new sponsors for the 2017 Animal Tracker until January 31, 2017. To learn about sponsorship and how to add your own questions, please contact us. The 2016 Animal Tracker was generously supported by EJF Philanthropies, Alley Cat Allies, the American Society for the Prevention of Cruelty to Animals, American Anti-Vivisection Society, Animal Legal Defense Fund, Animal Welfare Trust, the Humane Society of the United States, Maddie’s Fund, the New England Anti-Vivisection Society, Pettus Crowe Foundation, RedRover, Tigers in America, and the Massachusetts Society for the Prevention of Cruelty to Animals.